133 Field Ambulance served in France with the 44th (Home Counties) Division of the British Expeditionary Force. The Division was posted to the Middle East in 1942 and saw action at El Alamein, after which the Division was disbanded and the Ambulance was first moved to Syria, and then to Kabrit, on the Suez Canal in Egypt. It was here that the 4th Parachute Brigade was formed towards the end of 1942, and in January 1943 the 133 Field Ambulance began conversion to the airborne role. 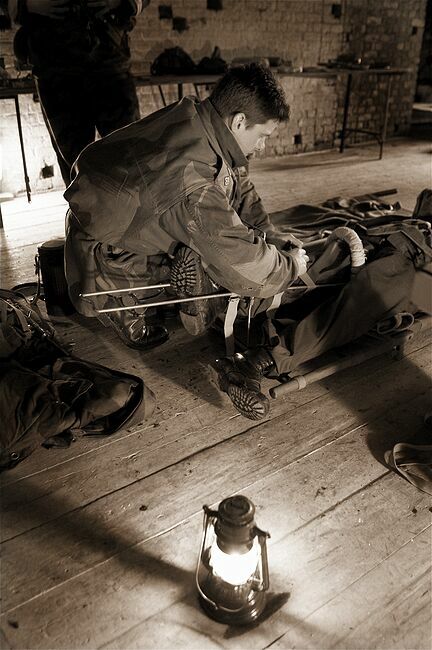 Parachute training was carried out at Kabrit, jumping from Hudsons in somewhat more primitive conditions than those who had been instructed in England would have been used to. In June 1943, the 4th Para Brigade was assigned to the 1st Airborne Division in North Africa. A number of their strength was lost when their fellow medical unit, the 16 Parachute Field Ambulance, asked for volunteers to take part in the 1st Para Brigade's assault upon Sicily. The 4th Para Brigade were not involved in this invasion, however they experienced their first action in Italy when the Division landed at Taranto on the 9th September 1943. The 2nd Para Brigade had suffered a disaster upon landing when one of its ships had struck a mine, resulting in 130 deaths and many injuries. On the following morning the 133 Field Ambulance occupied part of the Seamen's Hospital (the 'Ospedale Maritima') where they were charged with the care of the many casualties that had resulted from this tragedy. Elements of the 1st Airborne Division advanced inland, and although comparatively light resistance was encountered there were a number of casualties to be treated, and by the 15th September 67 cases had been placed in the hands of the Ambulance. During October the 1st Airborne Division was placed into reserve and the Ambulance relocated themselves into a 140 bed Main Dressing Station at a school in Gioia. 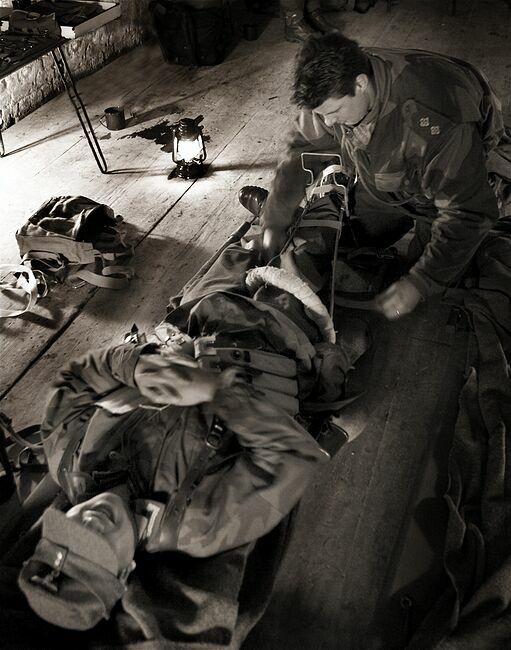 From the 10th to the 30th September, the 133 Field Ambulance had treated 761 casualties. Following their role in the Italian campaign, members of the Ambulance were awarded 1 OBE, and 2 Mentioned-in-Despatches. 7 men of the 133 Parachute Field Ambulance had been killed at Arnhem, and only 3 had returned. For their part in the Battle they were awarded 3 Mentions-in-Despatches. In spite of their almost total losses the Ambulance was rebuilt in Britain. When the war in Europe came to an end the 1st Airborne Division flew to Norway to oversee the German surrender, and on the 11th May 1945 the Ambulance was flown to Stavanger, where they took charge of the St. Joseph's Roman Catholic Hospital at Kristiansand. As well as looking after injuries and sickness amongst their own forces in Norway, the Ambulance also treated German soldiers and the many sick Russian Prisoners of War whose existence in captivity had been appalling. The 133 Parachute Field Ambulance returned to Britain on the 29th June, and following several postings to Nottinghamshire and Wiltshire its men were gradually distributed to other medical units until the Ambulance was finally disbanded on the 1st December 1945. Historical source of this page from Pegasus Archive.